There are so many things that we take for granted, like “Take out the trash, Go get your sister, Please grab that last bag of groceries..” the list goes on and on of the little things our kids do for us as they get older. 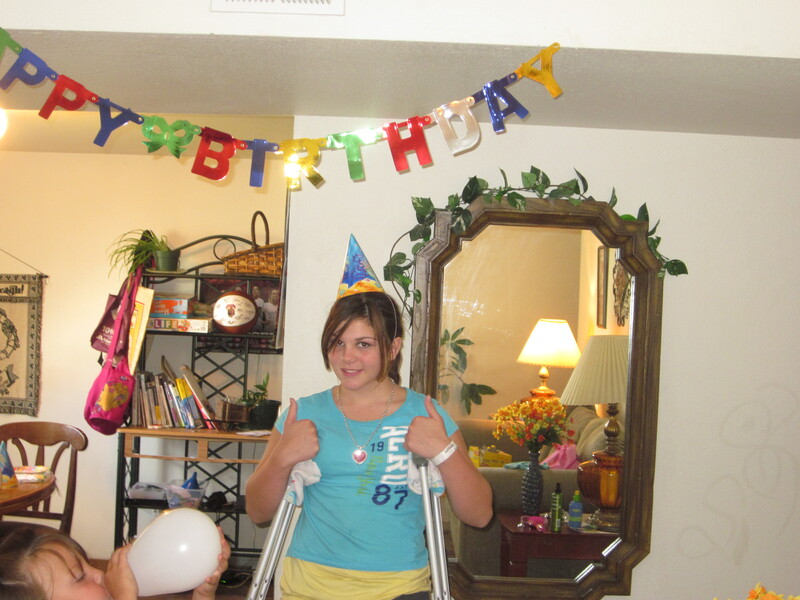 Jesse is solid for being responsible and mature( most of the time) and I am in awe of the way she handled having her leg broken, starting the eighth grade, and turning thirteen in the space of a couple of weeks. I would have been a sobbing, pathetic mess and I was at times. I surprised myself with nursing skills. A long resume of ” Would you like cream with your coffee?” helped me to be a decent caregiver and we iced and elevated and we concentrated on the things that we had going right. The list is unending, but simple. A home, our quirky little family, a job, a car.. you get my drift. I quit complaining as often because I watched Jesse crutch into middle school with a 40 pound backpack for the past eight weeks. She was like Rudy going into the tunnel at Notre Dame. Les was equally amazing and supportive. He always says “That’s why there’s two of us.” I am so thankful. He joined us at the doctor’s office every time to cheer for the basketball girl who got sidelined by a skateboard. He makes me laugh when I want to scream. Jesse has been off the crutches and the boot for a couple of weeks now, but still is under strict instructions not to run or pivot. She limps but has healed enough to do three hours of trick or treating the other night with her girlfriends and race through a haunted house. Whoops. Now she asks me to go get her backpack and I have to stop myself from automatically going down the hallway and bringing it to her. She is used to my willingness to be her servant and has questioned my loyalty on more than one occasion, but most of all, she has earned my admiration for getting through the tough times by looking forward. Things are almost back to normal. She is back to prowling the mall, not taking out the trash and fetching her sister by standing right next to me and bellowing her name. I find myself wanting to tuck her in at night (NOT! she says) and going in for more hugs despite the teenage disdain. That’s ok. Keeley had a long-boarding accident on a chunk of sidewalk- no broken bones, but has located her cellphone and moved back to this side of the Mississippi. At thirteen, I remember caravaning((see below) down Chaffee Ave. with a city bus right behind us. No helmets, no pads, no fear, some blood. By the time McKenna turns teen, I will have a full head of snow-white hair and soft pastels will illuminate my padded room. Bring Halloween candy, the kids count theirs. Caravaning- an eighties practice of balancing 2 people at the top of a steep hill with their butts on a skateboard and their heels on the other persons’ skateboard and locking hands, leaning to the side and kissing any exposed skin or common sense goodbye.